As featured on the Best of Machinery website, the California Air Tools 4620A is an ultra quiet twin tank air compressor, fully functioning at just 70 decibels, so it is fabulous for use within confined spaces or in areas where noise pollution must remain restricted. This air compressor requires very little maintenance and costs next to nothing in repairs due to the fact that it has an oil-free pump. 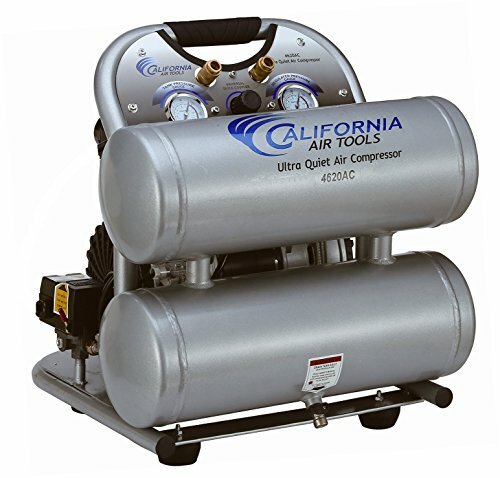 This is also assisted by its rust free aluminum tanks with a capacity of 4.6 gallons and only weighs 69 pounds – one of the lightest air compressors available on the current market. This is an easy to use compressor as it has an easy start valve which enables it to start with no load. The California Air Tools 4620A has a low amp draw at just 14 amps but has a powerful motor running at 2 horsepower. This is a stand-alone air compressor so perfect for constant or frequent use in the same area, though due to its weight can be lifted easily by a single individual if the compressor was required in an alternative location. The California Air Tools 4620A requires very little maintenance so will not be costly in servicing or repairs, saving not only money but also time and inconvenience. This is a very quiet air compressor, so it will not cause huge noise disturbance if it is being used internally or in built-up areas. A great option for reducing noise pollution. Having aluminum tanks prevents rust from being able to build up. This means that there is no worry of the rust flaking off, building up and blocking up the pipes which could cause a dangerous obstruction. This makes the California Air Tools 4620A a really safety conscious option. Being just 69 pounds, this air compressor is easy to lift without the need for multiple people to do so and will not cause injury when a new location is required. It is able to stand in a very stable manner, maintaining its balance with its horizontal tanks. The California Air Tools 4620A does not have wheels, so it is harder than some air compressors to change location, though it is light enough to lift without great issue. For some people, it is preferred that their air compressor has vertical tanks as opposed to horizontal tanks, but this is very much a personal preference. The California Air Tools 4620A is suitable for anyone who requires an air compressor frequently in the same location, such as a garage or on a farm. A great option for anyone working in built-up areas where noise must be restricted or decibels must be strictly monitored in relation to noise pollution laws. For anyone requiring a powerful air compressor of 2 horsepower but doesn’t want to pay large electricity bills, as it runs on just 14 amps. Ideal for anyone who doesn’t always remember to maintain their machines, as this air compressor is very low maintenance and has an oil-free pump. If a highly technical machine with lots of buttons, dials, and gauges, seems rather daunting, then this could be the solution for you. It’s easy to use, has an easy start valve and is able to start with no load. It is not highly technical so will not be off-putting for even a beginner to use. We like the California Air Tools 4620A because it is so simple to use, easy to maintain and is so very reliable. This is a very powerful air compressor which is able to undertake any type of job, is light enough to be lifted independently and is quiet enough to be used indoors or within built-up spaces. How to Adjust Air Compressor Pressure Regulator? How To Use A Porter Cable Air Compressor? How To Use a Paint Sprayer With An Air Compressor? How to Adjust Cut-out Pressure on an Air Compressor? We hope you enjoyed our article on "California Air Tools 4620A Review & Buyers Guide", if so, please share and rate it.